2018 Aprilia Shiver 900. Picture credits - Aprilia. Submit more pictures. Powered by a new twin-cylinder engine, the naked bike from Noale grows in engine capacity to guarantee more torque and more fun. New performance combined with an absolutely top shelf frame for a rideability that raises the bar to new heights in the naked sport bike segment. Fuel system: Injection. Ride by Wire integrated engine control system. Frame type: Modular tubular steel frame fastened to aluminium side plates by high strength bolts. Removable rear subframe. Front suspension: Upside-down fork, 41 mm. Adjustable hydraulic rebound damping and spring preload. Rear suspension: Aluminium alloy swingarm with reinforcement truss. Hydraulic shock absorber adjustable in spring preload and rebound damping. Front brakes: Double disc. ABS. Wave disc. Four-piston radial calipers. Rear brakes: Single disc. Wave disc. Single piston caliper. ABS. Wheels: Aluminium alloy. Radial tubeless tires. Comments: Continental two channel ABS. Ride -by-wire. Ask questions Join the 18 Aprilia Shiver 900 discussion group or the general Aprilia discussion group. Bikez.biz has an efficient motorcycle classifieds. Ads are free. Click here to sell a used 2018 Aprilia Shiver 900 or advertise any other MC for sale. 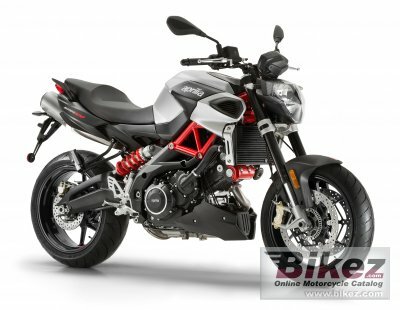 You can list all 2018 Aprilia Shiver 900 available and also sign up for e-mail notification when such bikes are advertised in the future. Bikez has a high number of users looking for used bikes. Before you buy this bike, you should view the list of related motorbikes Compare technical specs. Look at photos. And check out the rating of the bike's engine performance, repair costs, etc.